Finding car window curtains might seem like an antiquated notion, but they are still the best way to get shade and privacy in any vehicle. You might have kids who have a hard time with the sun that hits them every day on their way home from school, or you might need a shade that allows people to sleep on long drives. There are some amazing curtains listed below that you might enjoy. Take a look at each of these curtains to learn which would be best for your vehicle given its size, style, and the number of windows you need to cover. 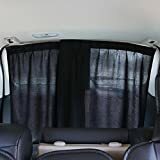 Yosoo made a car window drape that the perfect shade of black, ruffles in the way you would expect an old-style curtain to ruffle, and has UV protection that prevents any light from getting through. 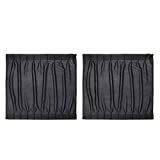 These drapes are very easy to install, and the fabric is very soft when it hangs from your car window. All you need to do is attach both the bottom and top bars to the window frame, and you can close these drapes without any issue. The UV protection prevents the fabric from getting too hot on a sunny day, and it effectively blacks out the window for little kids who are easily disturbed by bright lights. This shade is far too dark and serious for some people but it works well in executive cars that need that professional styling. The UXCell Sunshade Cloth comes with a simple bar that can be extended to fit any window area. The cloth itself is perfectly flat until you force it into space where you need shade. The cloth offers sun protection by keeping light out, and it can be adjusted as needed by simply pushing the cloth on the bar that was included with the kit. 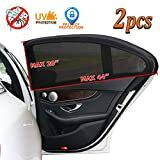 The UXCell product was designed to fit into any car, but they are not so big that they will black out the whole window. This is a good thing to use to find a happy medium. If you need more sun protection, you might want something bigger. The Winomo is one of the more elegant products that you could put in your car. The shades can be tied back when they are not in using your car so that your car almost looks like a living room that has been opened up for public viewing. You can release the curtains at any time, and they can be slid across the bar to close or open at any rate that you want. These curtains are a little bit looser than others, but they still give you a sun blocking protection that you need. They might still make the back of the car hot because you will get some sunlight come in through the bottom of the curtains. Car curtains are often meant to be fit to the window, and the curtains from Zatootoo will be used when you tack them to the window. The suction system that you use on these shades will stick to any window, and you will find that you can bunch up the curtains to get the shade you need. However, the shades do not cover the whole window because they are attached to the window. You get some sunlight coming through on the edges, and you need to be sure that you are comfortable without full coverage. Andux has made a luxury product that you can use in any vehicle given the bar that will adjust to any window. However, these are not the blackout curtains that you might have gotten from other brands. These curtains are designed to give you a bit of sun blockage while still allowing light to come through the windows. These curtains turn your car into a kaleidoscope of sun rays, and they can be adjusted on the bar as normal. Anyone who has sleeping children or needs blackout coverage might want to try a different curtain, but anyone who loves the sheer look could try these curtains today. Lifonder made a magnetic shade that will work in any car because it comes with the curved shade that will fit most windows. This sun shade is meant to give you complete coverage for the window, and it can be fitted to any car window. You get a sheer color on the outside of the window, and you get heat protection on the inside. The shade lets a little bit of light through, but it still keeps the light level very low as compared to window tinting. However, these shades are not really adjustable. They are meant to be left in place until you remove them. 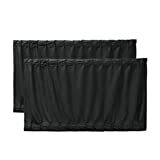 Car privacy curtains should be easy to install with just a bar and the curtain. These shades are meant to be as simple as your curtains at home, and you will find that the curtains can cover much of your window because you can set the bar anywhere that you want. The shades will slide across the bar, and you can adjust them to let in as much light as you want. You also need to be sure that you have checked how long the bar is so that you know if it will fit into your car. The Zatootoo Blue magnetic sun shades are perfect for you to use when you have kids in the car because you get the fun blue color coming through the car. These shades are magnetic so that you can adjust them for any window, and they are much easier for the kids to use because your children can move them around without using a bar. These shades are easy to use on curved windows, but the color might be a bit too extreme for you if you think it will make it hard for you to drive. 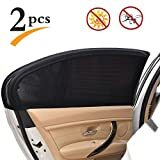 UXCell large sun shades are very helpful in that they can cover your whole window, black out the window, and work in an SUV that has large windows. You also need to be sure that you have used this bar to keep your window shades up. You can slide the shades over the bar with no trouble, and they flatten out when they cover the window. You get the very best coverage for the windows, and you will notice that the shades do not get very hot because they are made from a thick and padded fabric. 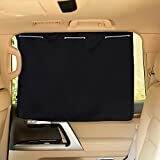 The fabric is just heavy enough to keep out all sunlight, or you could slide the shades out of the way when you are looking for a way to let in just a little bit of light during your drive. The VORCOOL sliding sun shade is nothing more than a curtain that you can use at any time. The curtain will pull across the bar that you have installed in the car. You need to be sure that you have taken a look at the way the shade fits to see if you can slide the bar into your vehicle. You could have the shades set up in any car, and you will notice that they do not move unless you decide to pull them across the bar. You get to use these shades for a full blockage of all sun, but they can be parted in the middle so that you could have a little bit of light pass through. The Linfonder curved sun shade for pets and kids is something that you can use when you want to fit the exact shape of your window. You might want to work with these shades because they can fit against your window tight. This is a bit like tinting your window, but it can be removed easily. 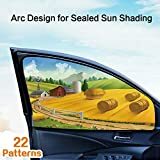 You will have the option to use these shades in any car, and you could use the sun shades when you have many cars that you might move between as you travel. The shades are very easy to use, and they provide you with a simpler way to protect the people who are in the car. Car window shades are often easiest to use when they are meant to pull around the frame of the door. You can slide this mosquito net over the frame of the window when the door is open, and you will get a lot of coverage when the door is closed. These shades are easier to use, cheap to buy, and provide you with coverage that you need. You can slide the shade over any window that you like, but the shade will not completely black out the windows. Uarter made a car window shade that will actually cling around the edges of your car door. You can install this shade in seconds when you are getting ready for a long trip, and the mesh design will deuce the amount of light that makes it through the window on your drive. This is not a shade that you pull back and forth, but it works well on long car trips when you know you will have the sun beating down on you for much of the drive. The Ocamo General rear window shade is a sheer curtain that is meant to help you cover the rear of your car regardless of the size. 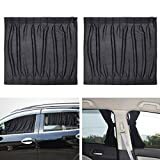 Most cars that you are driving have a large back window area that you can cover with this shade, and you might even use this shade as it hangs over the back seats. The bar will fit all the way across the back window, and you can slide the shades on the bar if you want the light to come through the back of the car. This sheer curtain might not give you enough coverage for bright days, but it works well when you want to avoid tinting your windows. The Pony Dance sun shade pulls across a string, and it is very easy to remove from one car and move to another. The Pony Dance shade is meant to blackout an entire window so that you could have a sleeping child in the back of your car. Windows covers for cars are often hard to move around because they come with a bar that is hard to adjust. This shade makes it easy for even your children to adjust. You get coverage in a standard car window, and you could let light in when needed. The Winomo SUV sun shades are very important for people to use because they provide you with enough coverage for a car with big windows. 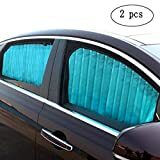 You can get window covers for cars without any trouble, or you might want to use these shades in a big car that might have larger windows. You can use the traditional bar design for these curtains, and the will pull across the bar with no problem. Not all SUVs are the same size, but these curtains can work in most cars. The shades pull across the bar, and they are easy to manage/clean when needed. Each shade on this list provides you with a bit of privacy and sun protection. However, all these items are just a little bit different. You might need something that is very executive and professional, or you might choose a shade that looks as though it came from the future. 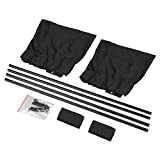 Adjustable bars and heavy curtains ensure that the shade does not move while you are driving, and you could black out parts of the car using these shades instead of traditional window tinting.